The Vice-Chancellor, Professor Olusola Oyewole, has solicited for the support of the various staff unions in the bid to move FUNAAB to a world-class status. 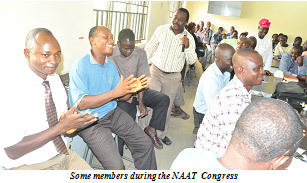 Professor Oyewole made the appeal during Management’s historic presence at the Congress Meetings of the Senior Staff Association of Nigerian Universities (SSANU), National Association of Academic Technologists (NAAT) and the Non-Academic Staff Union of Universities (NASU) held recently. It was the first time in the history of FUNAAB as far as members could re-collect that that a Vice-Chancellor was attending Congresses of sister Unions. “As the Vice-Chancellor, I am a member of NASU, I am a member of SSANU, I am a member of NAAT and I am a member of ASUU”, the Vice-Chancellor said. The parleys were meant to strengthen the relationship between the Union and their members and to ensure that staff understood the vision of Management. In his presentation titled, “Restoring Leadership”, the Vice-Chancellor stated that Management’s vision of advancing FUNAAB to a world-class Institution can only be achieved through the collective contribution of every member of staff, irrespective of his or her level. He appreciated the leadership of all the Unions for being partners in progress, while assuring that the administration is committed to providing a conducive working atmosphere, which will promote efficiency and effectiveness at the work place. Professor Oyewole emphasised that though Heads of Non-teaching units were now saddled with the additional responsibility of ensuring regular attendance and punctuality at work, the action was not intended to lower the enviable standard of the University, but rather to give leaders the opportunity to prove that leaders are ready to work beyond the government-stipulated eight hours. “The strength of the University is not in the timing, but in individuals who are responsible and carry out their duties without minding who is watching them”, he said. Speaking at the NAAT Congress, Vice-Chancellor described Technologists as experts in their various fields who over time have become specialists and are very relevant to the system. He therefore reiterated the need for staff to continually develop themselves in order to be relevant to the system, saying that a Committee on Capacity Building Policy was being constituted to ensure that staff development is fully embraced. He also disclosed that the Committee would be charged with the responsibility of developing a career structure and new rules and regulations for the University, adding however that until such a time, the existing one would still be used. Professor Oyewole said that an external member of the Governing Council would head the Committee while its membership would include two members of each Union, a former Vice-Chancellor and a Registrar from other Universities as Consultants. The Vice-Chancellor debunked the rumour that the 2013 promotion exercise would not hold, clarifying that the process had been initiated, but was truncated as a result of the on-going ASUU strike. He however assured members of staff that the process would continue immediately after the strike, reaffirming Management’s commitment to staff and students welfare. On the payment of hazard allowance, Professor Oyewole revealed that he was yet to receive funds from the government to that effect adding that he would make payments as soon as he receives the funds. 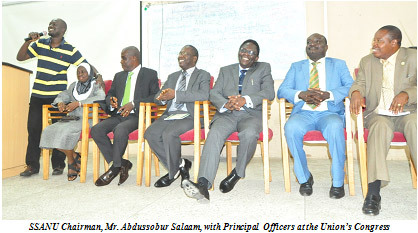 He thereafter encouraged staff to claim Overtime allowance truthfully stating that Management now sacrificially took care of overtime requests from the Internally-generated revenue (IGR) of the University. The Vice-Chancellor also said suggestion boxes would be provided to encourage members of staff to express their feelings and make suggestions on how to move the University forward. Responding, leaders of all the Unions, Comrade Abdussobur Salaam (SSANU), Comrade Sunday Akinbola (NAAT) and Comrade Ishaq Odunjo (NASU) on their different platforms assured the University Management of their support in the joint quest to move the University forward.